What is your typical morning like? Are you waking up feeling rushed and already stressed before the day really begins? I remember those days (not that long ago) when I wouldn’t consider waking up early as important or a priority. My day would just start off rushed to eat breakfast and get to work. I know that’s surely not the ideal and peaceful way to begin my day. But now I do things differently. Hearing from so many sources online that people who get up early and have a morning routine are happier and more successful I thought I’d try and take this whole morning thing idea more seriously. I have definitely noticed an improvement in my mood and how successful my day goes since being more intentional about my mornings. I feel more in touch with my soul and feelings in the morning hours and most of my priority tasks for the day are completed in the early morning hours way before I could be interrupted by anything or anyone. The best part is drinking my first cup of coffee (or two) in peace. It’s like a transformation from manic to magical you guys! Gradually, I’ve adapted and can actually say I’m a morning person. I never thought I’d say that. I thought working in the late hours I was productive and doing just fine but clearly I was wrong. I get soooo much more done since improving my mornings. Not only that, but I know I’m a lot more pleasant to be around after I’ve had time to myself to do the most important tasks in the morning. I can be a lot more helpful, present, and enjoy the company of my family when I don’t feel like they are competing for my time. I’ve had my morning ‘me’ time already! Do you wish you could get into a morning routine that starts with taking care of your heart, mind, and soul before serving your family? Crystal Paine of MoneySavingMom.com has created and used her own successful morning routine for years. She manages and runs a very successful business and with all other household responsibilities – amazingly enough, she also homeschools her three kids. She has designed a course around the tried-and-true habits that she has used as part of her own morning routine. 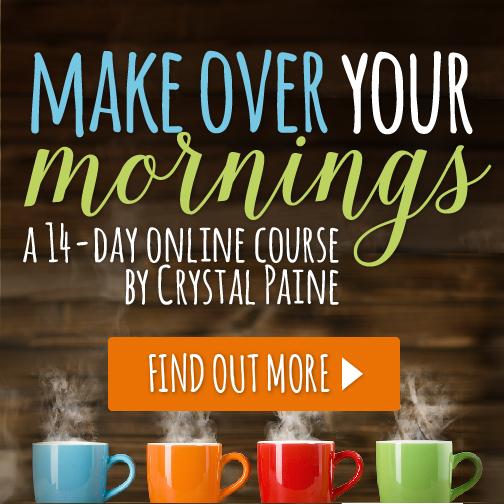 Crystal walks you through the strategies and tools that she uses for her own morning routine. Since every family is unique, she shows you how you can apply her strategies and tools to your own life, your situation, and your family, so that you can makeover your morning. If you are telling yourself that you don’t have time for a course like this to see a change in your habits? No worries! The wonderful thing about this course is that it takes a unique three-fold approach: a short chapter to read, a video to watch, and a daily project to complete. This will take no more than 15 minutes of your time each day. Anyone can find 15 minutes, and you’d be using that time to help you break free from that persistent zombie-like state. A small amount of time each day can potentially lead to amazing results for yourself, your family, and everyone else around you. This course is designed to help you revolutionize your productivity, streamline your days, invest your time and attention in things that really matter the most, and feel more calm and joyful. If you’ve ever wondered how and hoped that you could get more done, be more organized in your life, and find more time for yourself, then the Make Over Your Mornings Course is for you. From my own experience, I can tell you that I am proud of myself for taking the step to become more intentional with my mornings and really become a morning person. I feel like my routines, my days, and my life as a whole has improved because of it – and all because I made it happen.